I flew direct from Buenos Aires to Mexico City on Friday, and spent a busy weekend attending family commitments and social events. 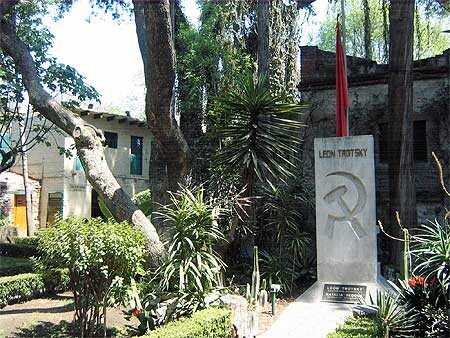 Of course, there were other activities, too: on Saturday, visits to Museo Casa de Leon Trotsky and La Casa Azul of Frida Khalo, both house-museums in Coyoacan. On Sunday, the afternoon was devoted to exhibitions. At the Museo Rufino Tamayo, most of the museum was dedicated to a solo exhibition of Wolfgang Tilmans, guest-curated and organized by Domenic Molon and Douglas Fogle. There was also an exhibition of a new installation of Thomas Hirschhorn; one of the museum curators, Tatiana Cuevas, organized this project. I was also tempted to visit the formerly-sleepy Museum of Modern Art (MAM), across the street from the Tamayo, as it is now directed by Osvaldo Sanchez, former artistic director of inSITE. There were numerous exhibitions at the MAM, two particularly memorable. One of them was a small but beautiful exhibition of Spanish-born painter Remedios Varo (1908-1963). Varo emigrated to Mexico in 1941 as a political exile and lived there for most of her life. Her exhibition included a series of beautifully illustrated drawings and paintings, filled with ghosts, doubles and other fantasmagorical references of the otherworldly. The works were collected by Varo’s late husband, Walter Gruen, who donated them to MAM. The other excellent exhibition was of the MAM’s collection guest-curated by the art historian James Oles. His curatorial address privileged “realism,” and the selection of works emphasized the cultural concern and ultimately paradigm of shaping modern Mexico, with the protagonist many times representing a community, the worker, and the common man and woman. While it was a collection exhibition, it was complemented by artworks on loan from other collections.